by Chris Woodford. Last updated: September 8, 2018. Humans have been shuffling round Earth for a couple of million years now—and you'd think, in all that time, we'd have discovered every material our planet has to offer. Not so! Our lives are still evolving, technologically much more quickly than biologically, and that means we constantly need to invent new materials and improve old ones. Some of the most exciting materials of recent decades are composites: combinations of two or more existing materials that combine the best properties of each. Cermets are composites in which ceramic materials and metals join together, typically to give something with the high temperature performance or wear resistance of a ceramic and the toughness, flexibility, or electrical conductivity of a metal. Let's take a closer look at what they are, how they work, and some of the ways we can use them! 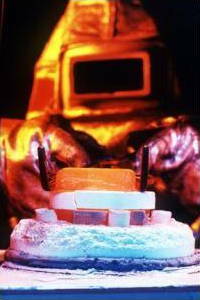 Photo: Testing cermets in military armor at Lawrence Livermore National Laboratory. Photo by courtesy of US Department of Energy Digital Photo Archive (DOE). Ceramic plus metal = cermet. It's really that simple! Why would you want to combine a metal and a ceramic? Metals, though versatile, aren't capable of withstanding the incredibly high temperatures you typically encounter in airplane jet engines or space rockets. Ceramics are brilliant at high temperatures and able to resist attack by chemicals and things like oxygen in the air, but their sheer inertness means they're just pretty boring most of the time. Brilliant for teapots and false teeth, but fairly hopeless when it comes to doing interesting things like conducting electricity or heat or bending and flexing. If you want something that can survive in really tough environments and still behave in interesting ways, you need to switch your attention to things like alloys, composites—and cermets. "Cermet" is a generic name for a whole range of different composites. 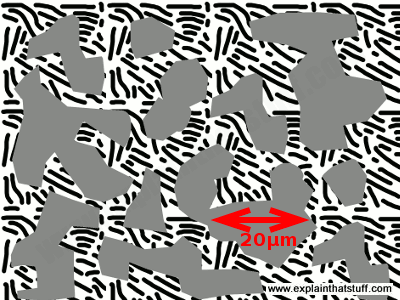 Sometimes the ceramic is the biggest ingredient and acts as the matrix (effectively the base or binder) to which particles of the metal are attached. Cermets used for electrical applications are typically made this way (in other words, they are examples of ceramic matrix composites or CMCs). But the metal component (typically an element such as cobalt, molybdenum, or nickel) can also be the matrix, giving what's called a metal matrix composite (MMC), in which hard ceramic particles are held together by a tough but ductile metal. Cermets used in things like cutting tools are made this way. Artwork: What's a cermet like inside? Here's a simplified cermet microstructure (the fine inner, structure you'll see if you look at a cermet with a powerful microscope). In the type of cermet used in cutting tools, the core (gray) might be made of a ceramic such as tungsten carbide, while the binder (black stipples) could be made of a nickel alloy. The scale shown in red is approximately 20μm (20 microns). Most modern cermets designed for tools have a core material that's a carbide or nitride of titanium, tantalum, tungsten, niobium, or molybdenum, and a binder of nickel or cobalt. Like other composites, cermets "work" by producing a material with a microstructure that has certain things in common with each of its different constituents. For example, the metal ingredient effectively allows electrons to flow through the material, enabling what would otherwise be a ceramic insulator to conduct electricity. That suggests cermets are relatively stable structures in which the metal and the ceramic are fixed in place—but that's not always the case. Under some conditions, cermets behave as though they have a dynamic surface layer, with metal particles constantly detaching and reattaching themselves. This effectively forms a smoother, harder, and more wear-resistant upper layer that makes a metal behave more like a ceramic. Artwork: How do cermets conduct electricity? Here's the structure of a typical cermet made from particles of ceramic alumina (red), each of which is surrounded by platinum metal (blue). Although electricity doesn't normally flow through a ceramic, it can flow through a cermet (yellow arrowed line) by following a circuit through the platinum. Artwork based on a drawing from US Patent 4,183,746: Cermets by Stephen L. Pearce and Gordon L. Selman, Johnson, Matthey & Co., Limited, courtesy of US Patent and Trademark Office. Apart from better electrical properties, the metal component of a cermet makes it more ductile (capable of being drawn thin into strands or wires). It also gives better resistance against thermal shock: often, if one part of a ceramic material (such as glass) is hotter than another, it will crack fatally or even shatter; the metal part of a cermet helps to avoid this by conducting the excess heat and dissipating it safely through the material. What are cermets used for? Electrical components are one obvious application. Because they can get extremely hot, they need to behave like ceramics but, since they also need to conduct electricity, it helps if they work like metals. Cermets offer a perfect solution in components such as resistors and vacuum tubes (valves). Crudely, we can think of cermet resistors as a mixture of an insulator (the ceramic matrix) and a conductor (the metal particles), with the type and relative proportions of the two "ingredients" (ceramic and metal) determining the ultimate resistance. Artwork: An early design for a cermet-based electrical resistor from the 1950s. The cermet (red, 10) is made from a nonconducting glass binder and conducting metal particles, mounted on a ceramic, insulating base (blue, 11), and connected to a circuit through two electrodes (green, 12/13). Artwork from US Patent 2,950,995: Electrical resistance element by Thomas M. Place, Sr. and Thomas M. Place, Jr., Beckman Coulter Inc., courtesy of US Patent and Trademark Office. Machine tools are another increasingly common use for cermets, which offer greater toughness and wear resistance than more traditional materials. Titanium carbide (TiC), from which many cutting and drilling tools are made, is a popular choice of cermet for tools used in milling, turning and boring, and for making threads and grooves. Typically cermet tools are made from either titanium carbide alone, titanium carbide and titanium nitride (TiN), or titanium carbonitride (TiCN). Generally, cermets provide higher cutting-tool speeds, better surface finish, and last much longer than traditional tool parts. Unlike tools coated in carbide, cermet-coated tools do not wear in the same way but effectively regenerate themselves. Photo: Cutting tools made from cermets last longer and produce a better surface finish than traditional carbide tools. Photo by Eduardo Zaragoza courtesy of US Navy. The interesting surface properties of cermets also make them useful for reducing friction in machine parts. Some companies sell "ceramic metal conditioners" for engines that simultaneously make metal surfaces both smoother and tougher, reducing friction and wear at the same time, giving the dual benefits of greater fuel economy and longer engine life. Products such as this provide similar benefits to lubricants but work in an entirely different way by effectively modifying the surface structure of metal machine parts to make them behave more like ceramics. Since the particles involved are atoms and molecules, what we have here is a perfect example of nanotechnology in action. Military applications of cermets include their use as lightweight protective coatings on clothing and friction-reducing surface layers on nuclear submarines. What else will we use them for in future? Watch this space! Have you ever come across cermets? You might have some inside your body right now! That's because they're often used as dental fillings, as an alternative to amalgam (metal alloy) and composite fillings. Traditional dental amalgam (an alloy of roughly 50 percent mercury plus silver, tin, and copper) is relatively inexpensive and long-lasting, but its dull silver color often looks ugly and unattractive. There's also a long-standing controversy over whether it has harmful effects on people's health (mercury is toxic) and it's a significant cause of water pollution in the environment. Composite fillings (sometimes called composite-resin or white fillings) don't have these problems, because they're made from plastics mixed with ceramic particles (such as glass or quartz). Although they look more natural than amalgam, they're harder to fit and don't last as long: while amalgam fillings might last 10–20 years, composite fillings last more like 5–10 years and then need replacing. 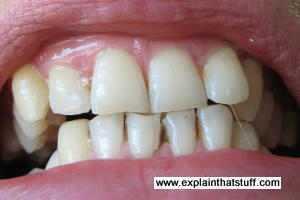 Cermet fillings combine the advantages of amalgams and composites. They're stronger than composites and as quick and easy to fit as amalgams (always a concern for nervous patients, especially young children), but contain no harmful mercury. Typical cermet fillings are made from a mixture of a ceramic composite and metal (silver) particles, so they're silver-colored, and look more like traditional amalgam fillings than white fillings. The ceramic composite, which is called glass ionomer, sounds complex but is simply a composite of glass particles (calcium-aluminium-fluoride-silicate) and a plastic polymer (polycarboxlate acid); it has the added benefit of releasing fluoride to help strengthen teeth. Cermet fillings have been less popular since the 1990s, following the development of another new type of filling called resin-modified glass ionomer (RMGI), which proved to be stronger, longer-lasting, and quicker to fit, and more closely matches the natural color of teeth. No matter how good a material is, there's always something better just around the corner! Metallurgist Peter Schwarzkopf of Metallwerk Plansee GmbH in Austria developed the first cermet around 1930. It was Titanit-S, with the chemical formula TiC–Mo2C–(Ni,Mo,Cr), a "hardmetal" made from titanium carbide and molybdenum designed for cutting tools. Unfortunately, it proved too brittle for widespread commercial use and it wasn't until the 1960s that titanium carbide cermets with a nickel/molybdenum binder were introduced by the Ford Motor Company for use in machine tools [Jaworska et al, 2006]. Performance of Cermet Tools by Erry Yulian Triblas Adesta and Muhammad Riza. Lap Lambert Academic Publishing, 2010. A short detailed monograph covering recent research into the use of cermets in machine tools. Powder Metallurgy: Science, Technology, and Applications by P. C. Angelo, R. Subramanian. PHI, 2008. There's a useful summary of cermets in section 9.4 on p205. Tool Materials by Joseph R. Davis (editor). ASM International, 1995. A detailed book covering metals, alloys, ceramics, carbides, and cermets (which have their own chapter, beginning on page 59). Cermets Get Assertive by Peter Zelinski. Modern Machine Shop, 15 December 2005. 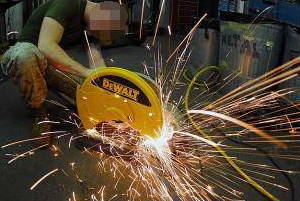 This relatively accessible, non-technical article argues that it's time for a fresh look at cermet cutting tools, which offer higher performance over more demanding conditions than ever before. These include detailed technical descriptions of cermets and how they're designed for particular applications. US Patent 6,387,552: TiCN-based cermet by Yusuke Iyori et al, Hitachi Tool Engineering, Ltd. 14 May 2002. Describes a cermet with high crack and wear resistance made from a hard ceramic carbide, nitride, or carbonitride in binder of cobalt and nickel. US Patent 5,186,739: Cermet alloy containing nitrogen by Kazutaka Isobe et al, Sumitomo Electric Industries, Ltd., 16 Feb 1993. Describes a drilling tool based on a titanium nitride or carbonitride cermet. 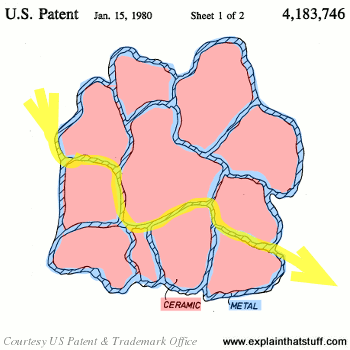 US Patent 4,183,746: Cermets by Stephen L. Pearce et al, Johnson, Matthey & Co., Limited. 15 Jan 1980. A good overview of cermets and how they're made. US Patent 3,971,656: Spinodal carbonitride alloys for tool and wear applications by Erwin Rudy, Teledyne Industries, Limited. 27 July 1976. This influential patent describes the development of improved (stronger and easier to make) titanium carbonitride cermets for use in machine tools. 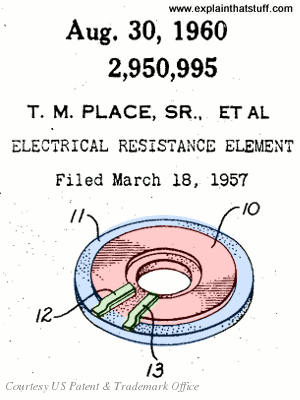 US Patent 2,950,995: Electrical resistance element by Thomas M. Place, Sr. and Thomas M. Place, Jr., Beckman Instruments, Inc., 30 Aug 1960. An early description of electrical resistors made from cermets. This patent apparently predates the word "cermet," but that's effectively what it's referring to.